If your eavestrough gets clogged frequently or you just don’t want to worry about routine cleaning, there are a number of options available to reduce maintenance. Leaf screens are fitted on top of the eavestrough (as in the photo above), allowing water to drain while keeping leaves and other debris out of the troughs and downspouts. We offers the Gutter Clean System, a worry-free solution for existing gutter, because it helps protect your gutters against the weight of ice and snow and against expansion caused by freeze and thaw cycles. Backed by a 40 year clog-free warranty, leaves, debris, and snow will no longer be able to get into your gutters and keep them from performing properly with our gutter protection system. We installs and offers the T-Rex system for new gutter installation, an innovative gutter management system with a continuous hanger designed to keep your gutter straight and clean for many years. Its protects gutters from damage caused by ice and snow, helps them perform optimally year round, and prevents debris from accumulating inside them. 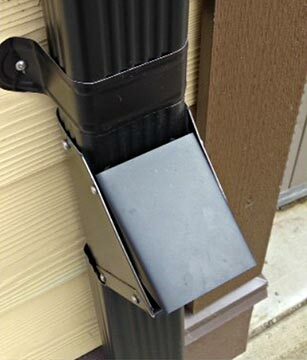 It mounts your rain gutters solidly on your home, making them much sturdier and more long-lasting that those mounted with spikes and hangers spaced at intervals. The T-Rex Continuous Hanger comes with a lifetime warranty on material and sturdiness. It also comes with a 40 year warranty, ensuring that your gutters won’t clog and will be stronger and more durable. Fast flow funnel systems are designed to move larger amounts of water more quickly so leaves and debris are continuously flushed through the eavestrough and downspout. The leaf trap is a device placed on a downspout just above ground level that collects debris and can be easily cleaned. They are often used with fast flow funnel systems, but can also be installed with a traditional eavestrough system. Not sure what would be best for you? Give us a call and we’ll come and have a look around.